The tall lamp post and rather small roundabout in the middle of Crown Square replaced the tram shelter. The shelter had been removed with unseemly haste before the tramway up Bank Road had stopped running, albeit that it was only a few days beforehand. All signs of the tramway were removed from both Bank Road and Crown Square and the park head was cleared of shops, replaced by a pleasant area of seating next to the Hall Leys Park. The bus that is on Causeway Lane was a Hands motor bus, registration number RA5031, designed to carry 35 people. The sign on the front shows it was going to Cromford. A charabanc was parked to the side of "Burgon's Supply Store" which is being studied by a small boy wearing a cap, long socks and short trousers - the clothing that most young boys wore at that time. The second bus in the picture, next to the roundabout, was not keeping to the left so was on the wrong side of the road. Signs for W. H. Marriott's auctioneers are displayed on two of the Causeway Lane buildings and the former Ernest Bailey's School can be seen on the hillside behind the auctioneers. 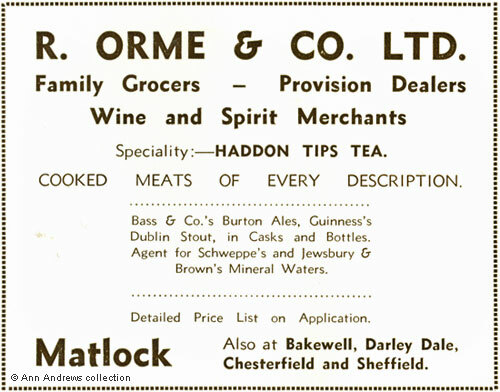 Orme's Grocery & Provisions store was on the corner of Causeway Lane and Bank Road (see advertisement below). It had moved there a few years before, following the compulsory purchase of its shop next to the County Bridge. The first shop on Bank Road past Orme's was Boden's Pastrycooks, run by John William Boden, which had a Cafe above and later became Rock Cafe. Further along the parade were The Derbyshire & Nottinghamshire Electric Power Company showrooms, Matlock & District Gas Company's showrooms (later the Sheffield Gas Company), Arthur William Gessey's stationers, Evan's cafe and confectioners (run by Miss H. Aspinall) and J. H. Dewhurst's butchers at the end of the row. The signs are almost impossible to read. Matlock's Post Office is set back from the road so cannot be seen, but is on the right hand corner of Lime Grove Walk. Quite what the store was on the opposite corner is uncertain, but the sign over the window reads "CASH" and the window dressing seems to be quite elaborate. The shop later became Greaves Furniture Stores and then Haydn Stanley's. Behind the Crown Hotel was a small park called Imperial Road Gardens which is where the Lido was eventually built. The gardens were on land previously owned by Rev. Wolley Dod and had been purchased in three parts between 1900 and 1905. 1. 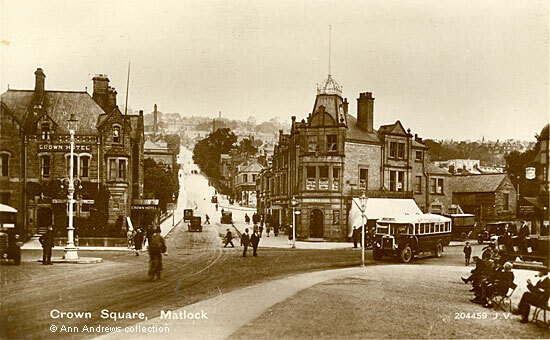 "Crown Square, Matlock". Valentine's Series of "Famous Throughout the World", No.204459. A Real Photograph. Number indicates it was possibly taken as early as 1928 although the card was posted in 1934 at Matlock Bath. Message not relevant. Postcard and advertisement in the collection of and provided by and © Ann Andrews. Researched by and written by and © Ann Andrews. Waite, Glynn (2012) "The Matlock Cable Tramway", Pynot Publishing, 50 Main Road, Holmesfield, Dronfield, Derbyshire. ISBN 978-0-9562706-5-8. He records that the cable and pulleys were removed, but the cast iron yokes that had been embedded in concrete had been left under the road and were rediscovered in the 1970s. Glynn Waite extracted this information from an Omnibus Society publication about North Western buses, which gave details of the vehicles the company inherited from other firms (and the dates) and what subsequently happened to them, although not all were traced. See Marchant Brooks Sale Rooms, Causeway Lane, 1946. "Derby Daily Telegraph", 18 March 1936.